MANILA, Philippines - End of the road for Gilas Pilipinas. The Philippines men’s national basketball team exited the FIBA 2016 Olympic Qualifying Tournament (OQT) Manila leg after falling anew, this time in the hands of FIBA Oceania power house New Zealand, 89-80 on Wednesday, July 6 at the Mall Of Asia Arena in Pasay City. 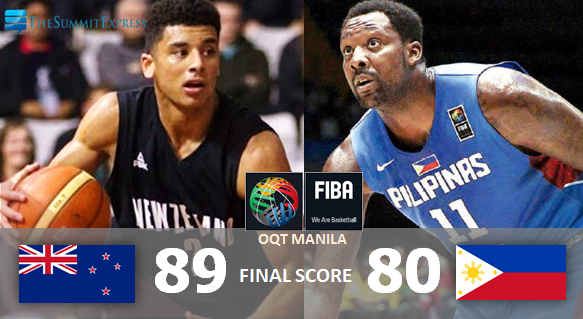 Road to Rio has finally ended for Gilas Pilipinas as Tall Blacks gave them a painful beating. After the national anthems of both competing countries had been played, the Tall Blacks performed the traditional “Haka Warrior Dance” at the center court which was intended to intimidate their opponents. But Gilas Pilipinas stood in front of the Kiwis, looked at them straight and unfazed. Isaac Fotu, New Zealand’s energy guy made the first basket for the Tall Blacks. But after scoring first, he immediately fouled June Mar Fajardo underneath and the 2-time PBA MVP completed his 2 foul shots. Just as expected, Webster brothers Corey and Tai, Tall Blacks’ scoring machines worked hard too early to get a comfortable lead. But their counterparts, Jayson Castro-William and Jeff Chan showed their three-point shooting prowess to equalize the ball game 13-all. June Mar Fajardo, who scored Philippines’ first 2 points also committed his 2 personal fouls as early as the six-minute mark of the opening period. Just like Fajardo, Castro-William got his 2 personals as well that placed Gilas in the foul limit. Bobby Ray Parks Jr. was tapped by Coach Tab Baldwin to replace Castro-William and orchestrate the plays. Surprisingly, TNT Rookie Troy Rosario who substituted for June Mar Fajardo, kept the ball alive for Gilas as he grabbed multiple offensive and defensive boards. Rosario chipped in 4 markers and leveled the scores 17 apiece under a minute remaining in the first. The Tall Blacks got too lucky at the free throw line that gave them the 21-17 lead as the first 10 minutes of the ball game lapsed. Corey Webster opened the 2nd quarter with a bang from downtown while Andray Blatche who was scoreless in the first finally scored a floater over the outstretched arms of Isaac Fotu and Thomas Abercrombie. With 7:23 left on the clock, Gilas Pilipinas had already tallied its 3rd team foul that left Coach Baldwin no choice but to call a timeout. The dead ball didn’t benefit Gilas at all as Parks committed his 2nd personal and team’s 4th. Philippines reached its foul limit once again with 6:25 remaining in the half. As Corey Webster made his 2nd triple, Jayson Castro-William was sent back in and logged a quick 5 points to lower the lead 28-24. As expected, the game will be an all out shootout between the guards of both squads, the older Webster, Corey, had been too aggressive at the three point territory while the younger Webster, Tai, owned the shaded lane. Jayson Castro-William on the other hand, was the only Gilas player who was contributing for Philippines. Castro-William made 8 2nd-quarter points coming from 1st period foul trouble. At the end of the first half, the Tall Blacks headed to the dugout with a 7-point, 38-31 lead. New Zealand got its first double-digit lead courtesy of big man Isaac Fotu followed by Tai Webster’s uncontested layup. Fotu continued to drain triples and added more problem to team Philippines. June Mar Fajardo who was seated in the entire 2nd quarter made a huge impact in protecting the middle and took over the scoring chores. “The Kraken” poured 9 of his 11 points in the 3rd quarter alone and the reason why Philippines was able to bring the lead down to 6 from as high as 13. Just as Gilas had picked up its momentum, Corey Webster sank a cold blooded trey to bring the lead up 59-50 with 2:25 remaining in the third. Andray Blatche after hibernating in the first 20 minutes of the game, made most of his points inside and from the charity stripe. Gilas did well in the penultimate quarter and managed to close the gap 60-53. Time is of the essence for Gilas. Jeff Chan wasted no time as he added 2 more points to trim the lead down to 5 at the opening of the last quarter. Andray Blatche wowed the crowd as he fired from long distance and all of a sudden Philippines was just downed by a shot, 60-58. Refusing to let go of their lead, Tai Webster shut the crowd out with an and one and brought the lead back to 5 followed by another shot by Isaac Fotu to regain the momentum. Coach Tab Baldwin called a timeout to stop New Zealand’s scoring surge. Instead of the Tall Blacks getting iced after the timeout, it was Gilas who went cold as nationals continued to miss from both in and out. New Zealand on the other hand, was getting ample spaces for easy buckets. With under 3 minutes in the ball game, the Kiwis’ lead once again ballooned to double digits, 78-65. 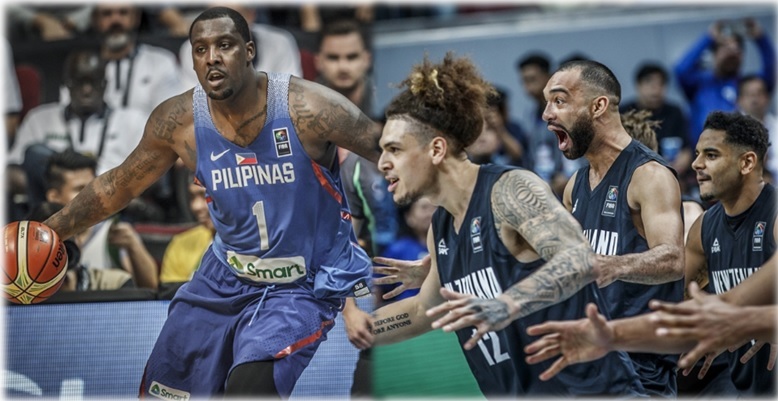 Gilas declined to give-up easily as Rosario, Blatche and Romeo sank three pointers but they were too late as the Tall Blacks finally broke away with a 89-80 win and will move on to the semifinals and more likely to face Team Canada after the latter dismantled Senegal early this evening for the 2-0 win loss record. Gilas Pilipinas with no more games left to play had been officially eliminated from the tournament.